I took the unix timer code, and got that working (not surprising, NeXTSTEP still is 4.3 BSD at heart), and I fixed enough of the key bindings so it’s getting playable. In addition I went back through the WinQuake source and pulled out the BSD networking and that works great. There was a sound driver in there for the next, but it lacks the output functions…. 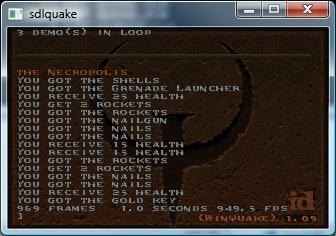 So it would seem that’s the last thing to hack through for a more ‘complete’ Quake experience.. well that & the mouse. Author neozeedPosted on May 21, 2010 October 6, 2011 Categories NeXTSTEP, qemu, quakeLeave a comment on Multiuser on Quake for NeXTSTEP! Ok, the machine I’m going to test this on, is a Vista x64 machine (I know I just couldn’t be bothered to upgrade it yet). The CPU is an Intel Core2 Quad Q9300 running @ 2.50Ghz, with 8GB of ram. The “Windows Experience Index” is 5.9 (It’s 5.9 across the board). 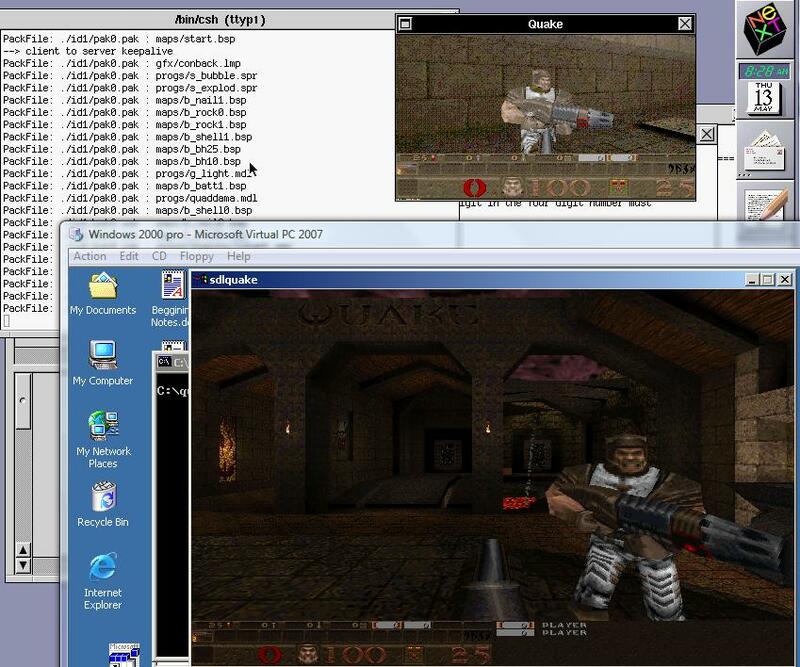 I’m using a redo of the SDL port of Quake 1 as a benchmark. You can download it here. Unzip it somewhere, and I’ve tried to make this pretty easy to follow… There are precompiled EXE’s for various CPU’s and Visual C++ levels. If you have Visual C++ 2.0 (I forget if I needed this for 4, and I just don’t feel like installing 5.0 right now) you may need a slight ‘hack’ to undefine some things that just don’t exist in the winmm.dll setup with the vc2.mak/b2.cmd . And this should produce an EXE with the /O2 flags for a generically built maximum speed optimized EXE. If your make has issues, you can try the build.cmd file which just blindly compiles the thing one at a time…. It should work as well. I’m blown away with just how fast this new version of Visual C++ is. Ok, my friends say I’m insane to have bought this… but I couldn’t resist. It’s a DEC Alpha 221164 machine, with 64MB of ram, and a 4GB disk! It’s the best technology of 1996-1997! So I’ve gone ahead and installed Windows NT 4.0 on the beast… at 600Mhz it’s pretty dammed fast… considering how old it is. Although I suspect a Pentium III I found in the garbage with a 1Ghz cpu is 2x faster…..
What makes this slightly useful for me, is that I do have Visual C++ 4.0 & 6.0 for the Alpha. So at least I can build *SOME* stuff to run on the thing…. So I’ve been fighting the compiler, and it seems it’s default blended optimizations do *NOT* work on my machine.. I’m sure this will be fun down the road. However it seems setting the target cpu to the 21064 produces ok code.. I’ve got to bench the stuff, but at least my exe’s are not crashing. So what have I manage to produce today so far? unzip is a major one.. It’s hard to use a machine today without it. The other thing I’ve manage to get running, is Quake! I’ve included my source & project trees as it was a feisty little thing to build..
I’m currently building & testing over terminal services so I don’t know what the speed is on the console… Also, this build does not include networking… I’m sure the winsock code will work just fine, I’m just not in a good position physically to test it, as Quake1 will *NOT NAT* correctly.. Also the SDL sound doesn’t actually output anything, so I’ve built it with the null sound driver..
I’d love to get that m68k->C build of frontier elite to go on the Alpha but I’m afraid my 64mb of ram will be a major constraint.. I know this isn’t much of an emulation thing, as the only emulator that possibly can run Windows NT for the Alpha costs upwards of $16,000 USD… It’s cheaper to score an alpha on ebay for $100 USD. I know it’s not much to ‘look’ at, but the pallet is correct, because it’s a real Alpha!.. Unlike the MIPS thing. 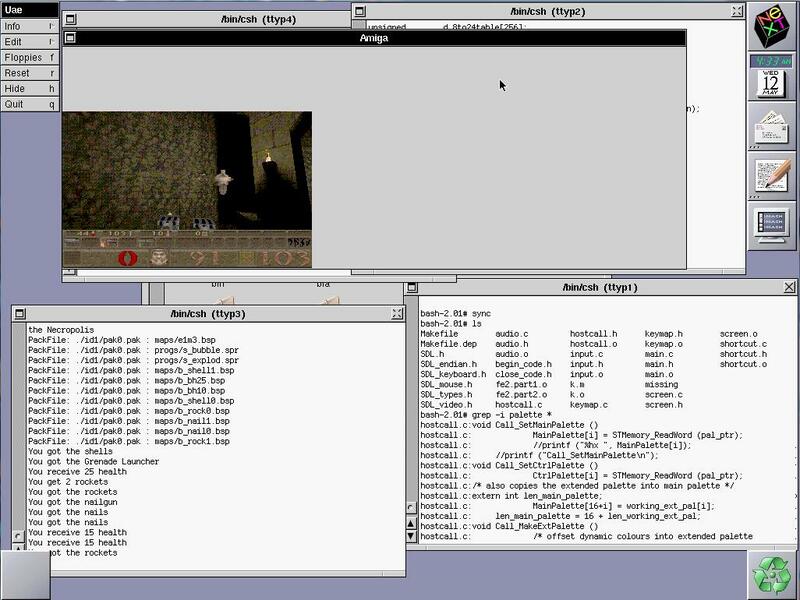 Author neozeedPosted on January 14, 2010 August 13, 2012 Categories DEC Alpha, games, qemu, quake, SDL, Windows NT 4.01 Comment on Well today I got my new Dec Alpha running! And they were disconnected. Some digging thru the source code revelaed that they were being dropped because they had ‘timed out’. But they did not timeout, the real cause is that the null_sys driver is TOO FAST!!! So this gave me a good excuse to re-use my failed SDL build for NT 3.1 (it has no video) but the timer works great! So with a little fun with the linker & Visual C++ 1.0 I managed to get it running! The SDL.lib will probably link with every version of Visual C++, but I’m no promising. Also it wont work video wise on NT 3.1 so don’t get all excited. Anyways no I havent put one on the internet… I dont know if there are enough people even slightly excited about quake… but it’s FYI…. Well I started this off hoping I could get Quake running on Windows NT 3.1 … I’m almost there I have the null version running just fine. However I’m not all that great with DIB programming so I was looking thru SDL and saw that it has a WINDIB driver! So with a LOT of tweaking through SDL 1.2.13 I got it to compile with Visual C++ 1.0!! However it is lacking one critical call, the CreateDIBSection api call in GDI is not present in NT 3.1. So remembering all the MIPS stuff as of late, and that I have Visual C++ 4.0 which should easily support this call, I first got it running with Visual C++ 2.0 on the i386 (Under XP of all things). So it was just a matter of building the source, and making sure there is no errors, uploading it to the emulator, and rebuilding for the MIPS. And after 30 minutes, I got my exe, and it ran! The exe is available here. And the source code with all the bits is right here. 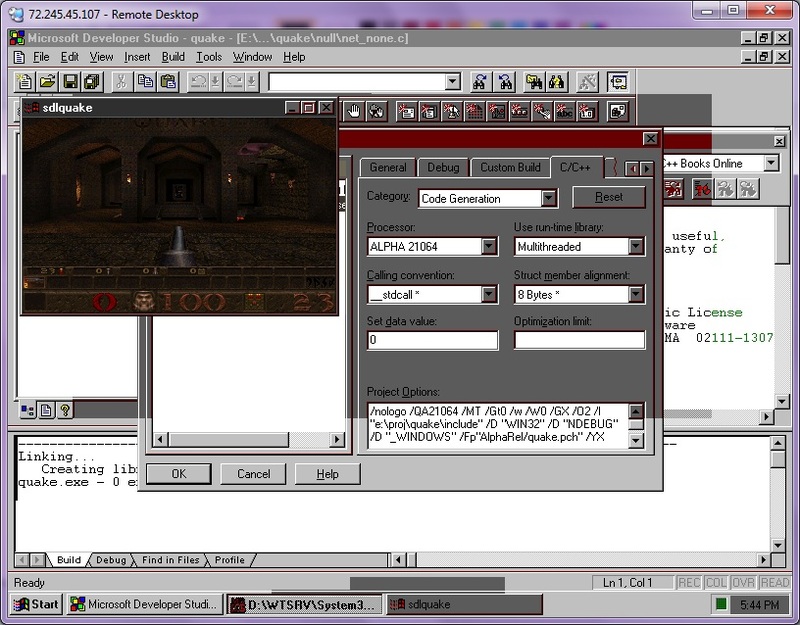 In this build I’m not building SDL as a DLL or static library, but rather compiling Quake right into the source. Now that SDL is running on the MIPS, and possibly other Win32 OS’s (I have yet to test Win32s… I suspect the inherent threading in SDL will prevent it, but could the DBI calls be made directly stripping out SDL…?) but who knows, I think anything past 3.51 would work.